A great idea for casual entertaining. Mix first 5 ingredients and 1 Tbsp. vinegar until blended. Place meat in slow cooker; cover with half the barbecue sauce mixture. Top with onions. Cover with lid. Cook on LOW 6 to 8 hours (or on HIGH 3 to 4 hours). Transfer meat and onions to large bowl; discard cooking liquid from slow cooker. Pour remaining barbecue sauce into microwaveable bowl; cover with waxed paper. Microwave on HIGH 1 min. or until warmed. Add to meat mixture; toss to evenly coat. Combine broccoli slaw, Miracle Whip and remaining vinegar. Fill buns with meat mixture, Kraft Singles pieces and slaw just before serving. Meat can be cooked ahead of time. Cool, then refrigerate up to 24 hours. Reheat just before serving as directed. Broccoli slaw can also be made ahead and kept refrigerated until ready to use. This is a great recipe to take to your next potluck. 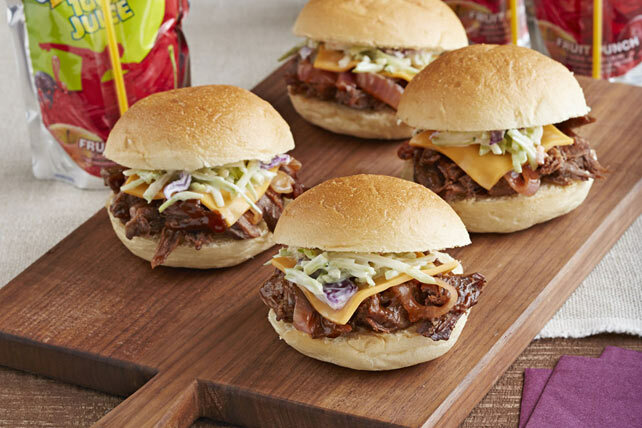 Just bring the meat to the party in the hot slow cooker and use to prepare sandwiches just before serving.